The Yu-Gi-Oh! TRADING CARD GAME takes Duelists through a futuristic and supercharged journey in Legendary Collection 5D’s, the latest entry in the popular Legendary Collection series. The Legendary Collection 5D’s set contains cards used by Yusei, Jack, Akiza, and Crow, plus other popular cards from this revolutionary era! In addition, each box contains one double-sided Game Board with artwork containing our modern Heroes on one side and fearsome Monsters on the other! Dueling and collecting are as easily affordable as never before: Star Pack 2 is an all-new product type with an SRP of only $.99! In addition to Merlin, this boxed set’s pre-constructed ALL-FOIL deck of Platinum Rares – a brand new rarity – includes a new Noble Knight monster and a new Spell Card. Also included are an all-foil Power-Up Pack with 3 cards, from a set size of 6 total cards, high quality, full-size rubber game mat, 70 new Round Table card sleeves, and a storage box to keep all the cards organized. A 43-card, all-foil pre-constructed deck, one 3-card Power-Up Pack (from a total set of 6 cards), one full size, rubber Game Mat, 70 card sleeves, and one storage box. Designed to appeal to Yu-Gi-Oh! fans of all ages, the Star Pack ARC-V booster set offers Duelists a slew of awesome cards at an incredible value. With an SRP of only $0.99, Dueling and collecting are as easily affordable as ever! Each pack contains 3 randomly distributed cards with 1 guaranteed Starfoil Card. Taken from a 50-card set, all cards will be made available as Commons AND as Starfoils. This means a whole bunch of cards never before seen as Starfoils, and a great value for the money. The Star Pack ARC-V set contains Deck themes from the first season of the new TV show, Yu-Gi-Oh! ARC-V like Raidraptors, Performapals and Superheavy Samurai. Duelists can also collect popular cards available in various sets, stretching from Legend of Blue-Eyes White Dragon to Hidden Arsenal, so fans can find Mobius the Frost Monarch and Polymerization to Gem-Knight Fusion, X-Saber Souza, and Constellar Algiedi. 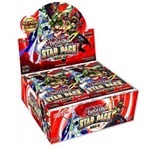 With so much value in each pack, Star Packs are a perfect option for Duelists who want to take their Dueling and collecting to the next level! Each booster pack of Star Pack ARC-V contains 3 cards with 1 guaranteed Starfoil card. Blackwing Decks have been one of the most popular Decks in America for two years running. And Duelist Pack: Crow is the best way for everyone to jump on board the Blackwing bandwagon! This 30-card set features reprints of 25 of Crow's most powerful Blackwing monsters, spells, and traps. It also has 5 brand-new Blackwing cards. Even experienced Blackwing champions will want to get these new cards for their Deck! Designed for booster draft or sealed pack play, Monster League will bring together a ton of surprising Monsters, Spells, and Traps to challenge your drafting, deck-building, and Dueling skills in a brand new way. Battle Pack 3: Monster League will include 10 new cards to enhance your draft & sealed games (2 new Monsters, 2 new Spells, and 6 new Traps). Like Battle Packs in general, the focus of these new cards is on battle, and of course they’re 100% legal for use in your regular, constructed play Deck. Whether you’re making your dead work for you with Ghosts From the Past, or just spinning out some quick defense with Quantum Cat, these cards are designed to throw a new twist into your Duels. Battle Pack 3: Monster League has Shatterfoils! These shattered-glass style cards use the same technology seen in later Duel Terminal sets. All 237 cards in the set can be had as Shatterfoils. Each pack contains 1 Shatterfoil card. 36 Packs of 5 cards. Konami Digital Entertainment Inc, is proud to bring you the latest product solicitation, Duelist Pack: Rivals of the Pharaoh. The greatest Duelists attract the most fearsome foes, and the legendary Pharaoh is no exception! Duelist Pack: Rivals of the Pharaoh is packed with cards used by and inspired by the Pharaoh’s toughest opponents and their most exhilarating Duels from the original Yu-Gi-Oh! animated series. For the first time ever, Xyz Monsters are coming to Hidden Arsenal booster packs, in Hidden Arsenal 6: Omega Xyz! Jam packed with nothing but foil cards, Hidden Arsenal 6 contains every kind of monster ever made, including Fusion, Ritual, Synchro, AND Xyz Monsters! Duelists who got on board with last year's Hidden Arsenal 5: Steelswarm Invasion will find new cards to boost all of the themes introduced in that set. They'll especially want to get their hands on Vylon Disigma, a brand new Xyz Monster. At last, the cards Duelists have been waiting for! Fans of the Yu-Gi-Oh! 5D's TRADING CARD GAME are in for a special - and very unexpected - holiday treat. Hidden Arsenal brings you 30 cards from the Duel Terminal arcade machine series - previously available only in Japan. Each Hidden Arsenal pack contains 5 all-foil cards from a 30 card set. Hidden Arsenal will contain all of the as-yet-unreleased cards from the first Duel Terminal card series, including must-have powerhouse cards like "Brionac, Dragon of the Ice Barrier" and "Mist Wurm." Hidden Arsenal is packed with new cards for 5 Deck types: X-Sabers, Flamvells, Mist Valley, Worms, and Ice Barrier monsters. Premium Gold: Infinite Gold is the latest solid gold collector’s set for the Yu-Gi-Oh! TRADING CARD GAME. With something for everyone, Premium Gold: Infinite Gold contains dozens of upgraded cards to bling out your collection plus 21 new cards for your Main Deck and Extra Deck, all gleaming in gold foil technology! Each 5-card Premium Gold: Infinite Gold mini-pack contains 2 Gold Secrets – each card a brand-new, never-before-seen card including several powerful monsters for your Extra Deck! Each mini-pack also has 3 Gold Rare versions of popular cards, so you can gussy up your golden gleam! As a special bonus, scores of Gold Rare cards in the set includes former Yu-Gi-Oh! Championship Series Prize Cards Number 106: Giant Hand and Digvorzhak, King of Heavy Industry, now available for everyone to use! Gold Rares are some of the shiniest and rarest cards around, and enshrined completely in Gold color, including Gold card frames, Gold art boxes frames, Gold text box frames, Gold card names, and for Monsters, Gold level stars! Gold Secrets take all of that and add a Secret Rare Card’s textured foil pattern on top of it! Special Editions give Duelists a great value, combining 3 packs of the latest Yu‐Gi‐Oh! TRADING CARD GAME booster release with 1 of 2 hard‐to‐find variant cards. In addition to 3 packs of Abyss Rising, each Special Edition box will contain a special championship‐level foil card sure to make a lucky Duelist’s day. Great value and excellent content will make the Abyss Rising Special Edition a must‐have for players of all skill levels. Duelists will want to take advantage of the second offering of Abyss Rising because many cards in this set can be combined with past and upcoming releases. Abyss Rising has plenty of cards designed to build on the new themes introduced in Return of the Duelist and Realm of the Sea Emperor Structure Deck. The newest Hidden Arsenal booster set includes the hottest and most powerful cards from the Duel Terminal. This all-foil 60-card set will contain highly anticipated Gem Knight and Laval themes seen in Generation Force and Photon Shockwave. All duelists will want these new monsters for their Decks! 60-card set includes 20 Secret Rare (1 per Pack) and 40 Super Rare (4 per pack).